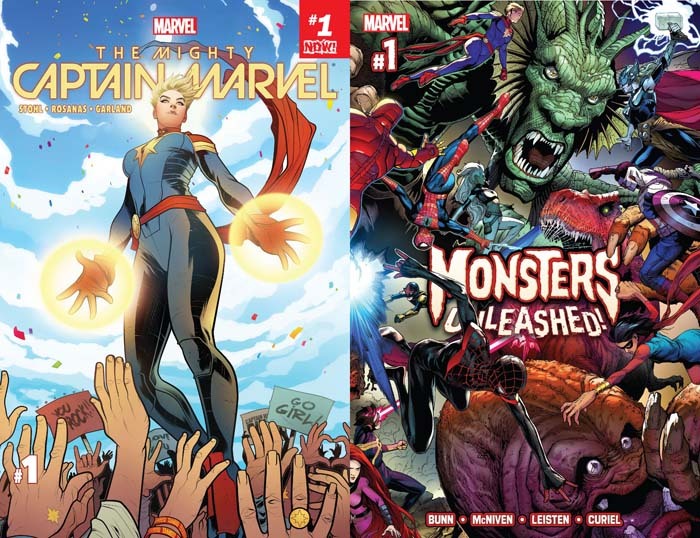 Home »Comics»Deadshirt is Reading: Mighty Captain Marvel and Monsters Unleashed! Though it feels like only yesterday I reviewed Captain Marvel’s last number #1 issue, I’m back reviewing The Mighty Captain Marvel #1. Following the end of Civil War II, Carol Danvers is one of the biggest superheroes in the world—though she’s now estranged from many of her old friends and teammates. Her popularity’s soared so much that she even has a live action project in the works—though it’s not a blockbuster movie starring Brie Larson, it’s a goofy, rather out of character “Cap’n Marvel” TV show. But there’s a mysterious shape-shifter lurking behind the scenes, ready to shatter Carol’s reputation. Novelist Margaret Stohl has the unenviable task of making Captain Marvel an appealing lead after her controversial role in Civil War II, but is largely successful. The plot is a promising mix of pop culture satire and political commentary, with Carol rescuing a Kree child who’s part of an alien refugee crisis. Superhero action is balanced with touching, emotional moments like Carol disclosing her childhood nickname “Bean” while sharing a bag of jelly beans with the Kree girl. Ramon Rosanas’ art is a great fit for the book, giving Captain Marvel a gravity and strength worthy of “the most powerful and most popular superhero on Earth.” His tweaks to the television “Cap’n Marvel” costume are wonderfully sly; with flowing hair, plunging neckline, and high heels, it’s a subtle dig at artists and fans who want Carol to be more hyper-feminine and sexualized. (If Brie Larson’s Captain Marvel costume ends up looking like this, I’ll laugh.) Though many fans may have turned against Carol after Civil War II, The Mighty Captain Marvel seeks to put her back in your good graces. Thank god for this event, honestly. With the rolling schedule of two or three blockbuster events per year, there should be room to try all kinds of stuff. And yet for every Secret Wars, it seems like there’s a half dozen boring stories defined by heroes being sad and punching each other. Civil War II’s slow-motion trainwreck cut my Marvel consumption last year down to the bare minimum. But Monsters Unleashed is simple and sublime and I love it. It’s a pretty high-concept book. Giant monsters in the style of Fin Fang Foom and other Kirby creations are attacking all around the world, and it’s up to our heroes (pretty much all of them) to punch and zap them into submission. The book is basically a showcase for McNiven and Leisten’s monster designs, and they shine. We get blends of classic creature features, Japanese kaiju, and nice visual homages to many and sundry monsters. The How To Train Your Dragon-esque two-header is particularly good. It’s a lot of big, bombastic setpieces, but it’s never too violent or particularly hard to follow. From a storyline perspective, there are some interesting wrinkles. Elsa Bloodstone’s back as a seemingly major player, a welcome surprise that has her running through booby-traps straight out of Indiana Jones. There’s also a newcomer, a boy named Kei Kawade, who seems to be the key to these monsters’ sudden appearance. I hope we get some clever twists later on, but for now, this fun, breezy event is exactly the palate cleanser I was hoping for.